The Hollywood location of the global creative media educator receives Student and Exchange Visitor Program (SEVP) certification to allow enrollment of international students. SAE Institute Los Angeles trains students for entry-level careers in the audio industry. At the foundation of SAE Institute’s more than 40 years as a global education provider of creative media is our international student population. 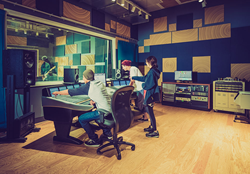 SAE Institute Los Angeles announced today it has received Student and Exchange Visitor Program (SEVP) certification, allowing the campus to accept international students into its Audio Technology Program effective immediately. Achieving the Student and Exchange Visitor Program certification permits the institute to accept individuals on an M student visa. With its prime location in the heart of Hollywood, SAE Institute Los Angeles has long garnered interest from international prospects, and this certification will allow students from across the globe an opportunity to study audio in one of the music and entertainment capitals of the world. Located in the former home of the Eastman Kodak Company, SAE Institute Los Angeles offers an Audio Technology Diploma program, which can be completed in as few as 9 months. This intensive, student-centered program trains students on professional grade equipment in order to prepare for entry-level careers in the audio industry. For more information about SAE Institute Los Angeles, visit http://losangeles.sae.edu. SAE Institute provides aspiring creative media professionals with a foundation of practical theory and valuable hands-on training in their chosen areas of concentration. Under the guidance of industry-experienced faculty, students gain the essential experience they need for entry-level jobs in the creative media industry. Students are supported in their job searches by SAE Institute’s international network of alumni, many of who are leaders in the music, film, game arts, and live performance arenas. SAE Institute offers accredited programs in Audio, Animation, Film, Games, and Entertainment Business focused on preparing students for employment in the creative media industry upon graduation. SAE Institute Group, Inc. is a part of Navitas LTD. Learn more at usa.sae.edu. Navitas is an Australian global education leader, providing pre-university and university programs, English language courses, migrant education and settlement services, creative media education, student recruitment, professional development, and corporate training services to more than 80,000 students across a network of over 120 colleges and campuses in 31 countries. Learn more at Navitas.com.